Apple juice is one of the most popular juices that people make with their own juicers, so to be honest, you can pick almost any juicer on the market and you should be able to make apple juice. But what is the best juicer for making apple juice? 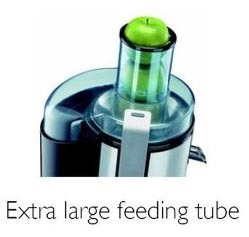 If you plan on making plenty of apple juice, it is worth buying a juicer with a wide feeder, such as the ever popular Philips HR1861 which has consistently shown itself to be the class leader. If you're looking for something cheaper, consider the Breville JE24 Whole Fruit Juicer. As you can see in the picture on the left, the extra wide feeder enables you to quickly put whole apples down there. Being able to pop a whole apple down and not have to cut them up really is a time saver. The Philips juicer shown also has a detachable pulp collector which you can line with a plastic bag and easily lift out most of the pulp, which makes cleaning up afterwards a heck of a lot easier. What apples to use in fresh apple juice? Most apples will make great juice, I particularly like the sweetness of a Pink Lady. Also, you know how an apple goes brown if you leave it? I find that apple juice does too, so if you're going to drink it straight away, cover it up with clingfilm or add a drop of lemon juice to help stop it turning an unappetising brown.